Published: 2013-04-18, by Manu Galvez. I didn't find any, did you? "Make room for platformers' next generation"
There can be something else than plumbers and hedgehog when talking about platformers. Actually, since we are currently running games on new mobile OS, it's time to give a chance to new titles that are making good stuff on old-classic gaming genres. 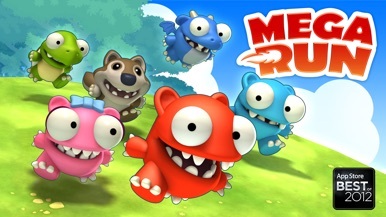 Mega Run is one of them. A mobile native platformer that merges the best of the classic while making the most of the new mobile tech. Redford is a little fun monster involved in an adventure to free his brother and sister, kidnapped by a monster and taken far away. 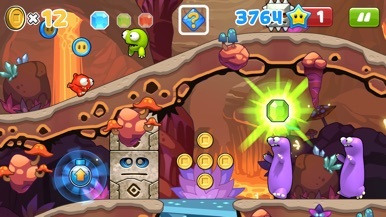 Our hero will have to travel across 5 unique worlds and 80 stages full of dangers, by grabbing coins, gems and power-ups that will help reaching the place where the monster have locked up his brothers. It won't be easy. 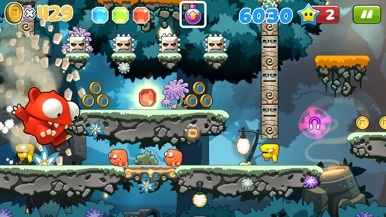 Lots of handicaps, obstacles and enemies must be faced in a fast-paced play rhythm. However, with your ability and the help of Redford's friends (there's a cast of playable characters to choose among), he will have a chance. Mega Run's 3D graphics are outstanding. Despite its (kinda) childish cartoon graphics, the game is for all audience. Both kids and grown-ups will love it. As I said, controls are mobile native, basically tap-based: tap to jump, tap longer to jump higher. Jump over enemies to kill them and then jump to double jump. In brief, lots of levels through different worlds, set in lovely 3D graphics, intuitive controls, lots of handicaps and power-ups and an achievement hall provided by GameCenter. A must-have. Get ready to start an epic jumping journey. This is one of those highly addictive game we use to call "timewasters". 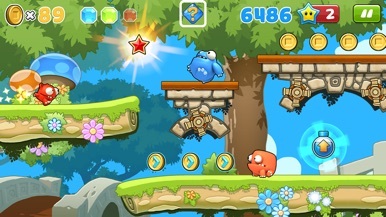 Help the jumping small creature to collect as many coins as you can, grab power-ups and avoid any monster or handicap trying to stop you. 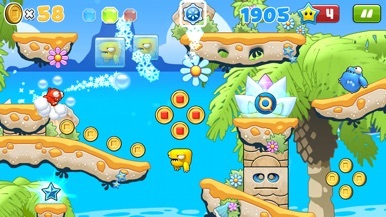 The small creature must collect coins and it can also use them as a platform to keep jumping. U….